That, with time, I had become accustomed to the hollow moments of an investigation is true. There are hours, days even, sometimes months or years when nothing happens. Those are the gaps in an investigation. In other words, those moments are life. The detective who wins a case, who solves it, is usually the one weathers those lapses. Resources are needed, of course. But above all, you need patience, that rare gift; or you need something else to think about—a certain capacity for distraction. You need a place inside yourself, your own language where you can hide. You need a refuge, yes. Any refuge. The work of Mexican writer Cristina Rivera Garza is, I would suggest, best entered with as scant a road map as possible. I cast no more than a passing glance at any reviews of The Taiga Syndrome, before venturing into the intoxicating and unsettling environment of this, her latest release in English translation. Not that her books can be given away in any straightforward terms, but to lose oneself in the oddly off-centre worlds she creates is the true pleasure of reading her fiction. So much so that, you might find yourself dragging your readerly feet to prolong your sojourn through the pages of this slender volume. What, then, can one say by way of review? This is the same dilemma I faced when I sat down to write about her novel, The Iliac Crest, which came out last year. The Taiga Syndrome, a subtle twist on the Latin American detective novel is, in a sense, less of a mystery and more of an dreamlike exercise in mysteriousness. The unnamed narrator is a detective who, with a string of unsuccessfully resolved cases behind her, has taken to writing noir novellas under a pseudonym. When she is approached by a man who wants her to find his second wife and bring her back to him, she almost dismisses the case as dull and hopeless. The man’s wife has disappeared, in the company of another man, into an area known as the Taiga, but the fact that she has been sending missives—telegrams from far off locations—like a trail of bread crumbs to mark a path, have led her husband to believe that she wants to be found. For our enigmatic protagonist there is something almost sensible emanating from the creased paper of the telegrams themselves that inspires her to accept the assignment. The same empathetic curiosity will guide her on her journey into the anomalous environment of the Taiga. Exactly where this region is located is never made explicit, but clearly it is distant, vast and remote. The presence of tundra and boreal forest suggest it lies to the north. The “syndrome,” distinct to the area, is a condition that sometimes strikes certain inhabitants who “begin to suffer terrible anxiety attacks and make suicidal attempts to escape.” Has that been the fate of the missing woman and her companion? Of course, in a place subject to its own strange rules and customs, norms are difficult to assess. Thus, this is a book about translation—of ideas and culture—the narrator and the translator she has secured to guide her into the Taiga are forced to communicate in a common language, one which is native to neither one of them, a “third space.” Translation creates distance. The reports of local residents have to be interpreted. Bizarre events defy explanation. And the faraway coastal city where a client awaits news of his second wife becomes increasingly vague and unimaginable. Who can resist observing the original body? A body without a social context? And as the minutes passed, I was also excited, no doubt, by my own incomprehension. I could never understand something like this, I told myself several times. I said it exactly like that: “I could never understand something like this.” But I couldn’t stop looking at him, fascinated, perhaps even bewitched or hypnotized by his thin figure, his exhaustion. Did he see me then, not by looking but by chance, not by directing his gaze my way intentionally but by letting his eyes clumsily meet mine? Something like that, yes. An arrow plunged into the left shoulder. A hole. And suddenly that moment produced the window. And the window produced the spectator. And those three elements together made the romance real. The passion. Someone longed for a freedom that was really an infernal abyss. Someone placed hands, now motionless, on the window. Someone who wanted to escape but couldn’t escape and could only watch. But what is she really telling us? 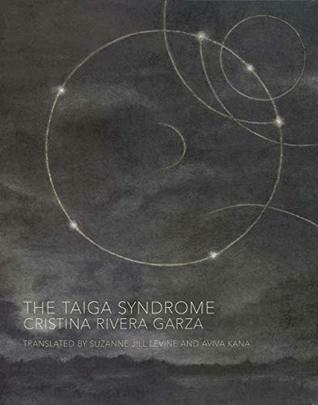 The Taiga Syndrome by Cristina Rivera Garza is translated from the Spanish by Suzanne Jill Levine and Aviva Kana, and published by the Dorothy Project. Breathing heavily, with fat drops of sweat sliding down my face and chest, I thought of how you are never more authentic than when inside your own nightmares. I almost hesitate to write about The Iliac Crest. I feel that to tread too carelessly into the heart of this enigmatic dark fable would be risk fracturing its utterly devastating beauty. One may be best to enter its world of shifting borders where space, time, reality, fantasy, sanity, madness, identity, and gender are bent, blurred and ever so steadily unraveled without any preconceptions. Not that there is a viable bread crumb trail that could be followed to ensure Absolute Understanding. But it may be best to let the narrator be your guide, or rather to accompany him as his self-contained, apathetic existence is disturbed and distorted. The novel is set in an undefined time, in an isolated borderland on the coast between North City and South City. To travel in either direction requires passing through heavily policed border checkpoints. Disappearance is contagious and faith in feminism is a faded notion—sexist attitudes toward women limit their roles in society. The image is a jarring one, and an atmosphere of hopelessness and decline is prevalent, nowhere more so than in the state hospital where the narrator works as a doctor tending to the destitute, wretched, and deranged who have come there to die. A note from the author, Mexican writer Cristina Rivera Garza, that opens the book provides some context. Navigating the US-Mexico border has been a constant in her life and this is reflected in the role that the idea of borders, geopolitical and otherwise, plays in this work. Many borders are challenged here, not least of which is the line between male and female. The consequences of rigid gender roles and the silencing of women’s lives and voices is a central concern in the story she has to tell. “Our bodies are keys that open only certain doors,” she says. “Our bodies speak indeed, and our bones are our ultimate testimony. Will we be betrayed by our bones?” As a reader with a gender different history myself, that question haunted me from the outset. The narrative begins on the classic dark and stormy night, when a stranger appears seeking shelter. She introduces herself as Amparo Dávila. The narrator is instantly captivated by her striking appearance and her expansive presence. But she frightens him. Several hours later, the woman he had been expecting, a former lover referred to only as The Betrayed, arrives and immediately collapses on the threshold. Before long, the women have installed themselves in his home, disrupting his solitary life. While The Betrayed convalesces, Amparo Dávila sets up a daily routine which includes sitting down to write in a notebook. She informs him that she was once a great writer. Now she is writing about her “disappearance” and she believes he can help her. Certain images and expressions are repeated, like refrains that echo throughout the text, creating an incantatory quality, enhancing the increasingly unsettling mood. The clarity with which the narrator appears to begin his account is steadily eroded until he can no longer trust his own sensations. As the line between truth and lies is obfuscated, the narrative grows chillingly opaque. But the tone remains measured, the language hauntingly beautiful. Hurried and intense brushes, a proximity that, out of so much fear, smelled of sweat and adrenaline. Everything, however, would return to normal with a kiss. Usually it was just that: a kiss. One. Lips together. Saliva. Time turned flesh, color. A long kiss, like an expedition. After, just after that, the separation began. The beginning. This. This walk like someone wearing shackles around their ankles, this sensation of the body against air in an age-old battle, this weariness, this desolation. What do I know about the great wings of love? The pelicans appeared again almost overhead, but much higher. I paused to watch them for a couple of minutes. Silence. Air. Time. I imagined them fleeing from their own wings and, in that moment, I raised my finger to my lips, trying to detect traces of something felt from far off in time. Yes, indeed, you turn back. And turning back achieves nothing. I confess I finished this book breathless. Anxious even. Although I knew that Amparo Dávila, the author at the centre of the mystery, is a real woman—a Mexican writer whose own work often treads the uneasy borders between the real and the uncanny—I decided not to search her until I had finished reading the novel. I was pleased to find an article in the Paris Review online and one of her short stories in the Winter 2017 print issue. Originally published in Spanish in 2002, The Iliac Crest has helped rekindle interest in Dávila who is now in her late 80s. Christina Rivera Garza captures her spirit, but in a mesmerizing, wholly original tale that is perhaps more timely than ever. 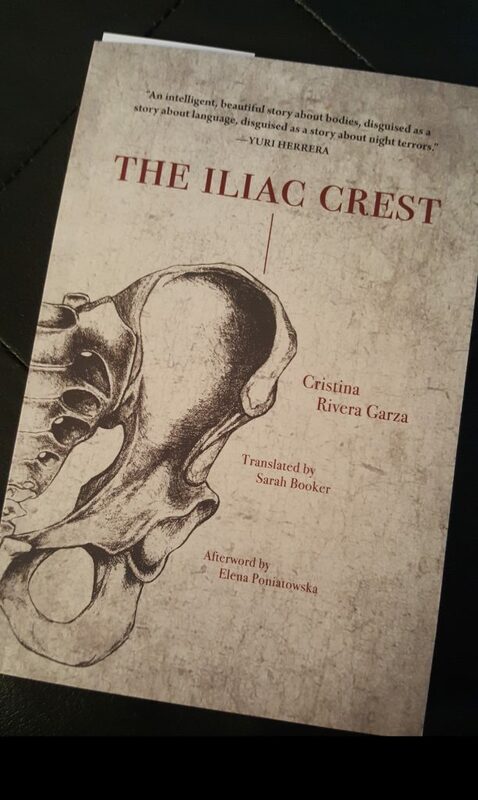 The Illiac Crest is translated by Sarah Booker who also provides valuable insights in her Translator’s Note. The publisher is Feminist Press. Note: Since posting this, translator Sarah Booker has kindly shared links to two other Dávila stories she has translated: “Griselda” and “The Square Patio” The latter, in particular, has strong resonances in The Iliac Crest.